When a naked Norwegian man is found brutally murdered in the Superior National Forest, and another naked Norwegian in shock nearby, U.S. Forest Service officer Lance Hansen, the first on the scene, begins a journey that has him questioning the past, family relationships, and his future. Vidar Sundstøl has written a mystery that is mostly introspective. Officer Hansen is a good man and officer and also happens to be the unofficial county historian, but it takes a detective from Norway, Eirik Nyland, to have him second guessing his own family and their possible connection to the murder. Nyland, on his first visit to the United States, is a touch amused at the manner in which the locals in the Tofte/Lutsen area of Minnesota remain connected to their Scandinavian past, but at the same time, touched that this connection remains so important. Nyland’s character is a bit unusual, however. While it seems important to have this Norwegian detective come to the U.S. to investigate the death of a Norwegian national, the story here belongs to Lance Hansen. Hansen, as historian, wonders when the last murder in the area might have occurred and discovers that an Ojibwe man disappeared from the area more than one hundred years ago, and that there might be a connection to the specific area (Baraga’s Cross) where the Norwegian’s were found. But the 100-year-old disappearance isn’t the only history that is on Hansen’s mind. An incident with his brother, Andy Hansen, during their school days, haunts him now, with some striking similarities to the savage murder. And though the questions follow him, Lance never mentions the potential connection to Detective Nyland or the FBI. Vidar Sundstøl’s story is not a mystery-thriller – it lacks chases and fights and tension – but it is a mystery. It is an examination of character and of the people who live quietly every day in the rugged Minnesota north. Sundstøl, a Norwegian who spent time in this area, is reflective and holds a mirror up to the community suggesting that community is what holds them together. The story has an ending, which wraps up a little too neatly on the one hand, and does not wrap up at all, on the other hand. Confusing? Yes, but I don’t want to give too much away. What is clear is that this is part of a bigger story – that Lance still has struggles ahead, and perhaps because Lance has struggles, and Nyland is keen and observant, perhaps he will too. But it is because the story wraps up too cleanly and it is too apparent that there is more to this story, that I have a problem with the book. I don’t like a book that doesn’t have an honest conclusion … a book in which you must buy the next book to get the rest of the story. I do, however, very much like the setting (one of my favorite vacation destinations) and the people. I know them all, which makes reading this so very much more clear. The forest and the lake are also characters here, which is as it should be when the lake is Lake Superior and the woods the Superior National Forest. I will read the next two books in the series, but I can only recommend this book with the caveat that it doesn’t stand alone, perhaps, as a complete story. Looking for a good book? 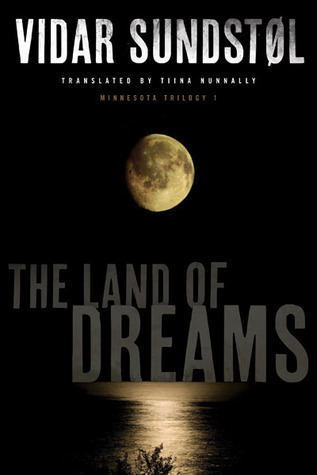 The Land of Dreams, by Vidar Sundstøl, is a mystery that relies on the beauty and the power of Lake Superior and the Superior National Forest, and those who live among them, to bring the story to life.